IDEAL FOR HOME & OFFICE: With its innovative Tabletop design it is perfect for office & home, simple and hassle-free operation, no bottles around you messing up your office and fits in any corner. TIME SAVING: Our top loading water cooler dispenser saves time when you need to make a quick cup of tea, hot cocoa, or instant soup! You never have to wait for a pot or kettle to boil.And that,you can also enjoy its ultra-quiet operation. 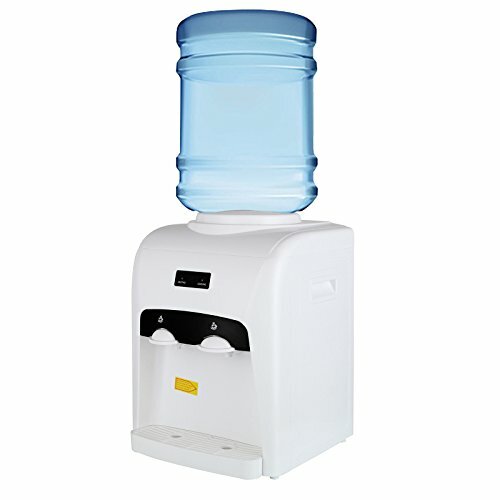 WATER COOLER ACCOMMODATES: This countertop water cooler has the ability to accommodate 3 or 5-Gallon bottles, it will save you hundreds of water bottles per year. Easy Cleaning:The funnel with a prong helps avoid water spills, and the removable drip tray provides you easy cleaning. If you have any questions about this product by KUPPET, contact us by completing and submitting the form below. If you are looking for a specif part number, please include it with your message.